The Writer's Challenge: Win a $50 GC on Monday 11/25! RELEASE DAY!! Win a $50 GC on Monday 11/25! RELEASE DAY!! 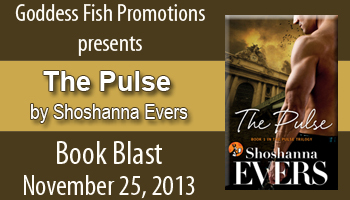 THE PULSE, Book 1 in the Pulse Trilogy! Goddess Fish Promotions has organized a wonderful book blast - we've got 25 participating bloggers, and you can increase your chance of winning a $50 Giftcard to Amazon or Barnes & Noble by commenting on the blogs! Set your calender, and support our blogging community by stopping by and saying hi! Some of the bloggers will also have reviews of THE PULSE, too! The 11/25 Book Blast will be on the following sites... get ready for some fun! !